One of the things we sometimes forget as parents is that our brain is hardwired for conflict. Spend some time with a 2-year old and you will see the way he is willing to stand up for his rights. “No” seems to be his word of choice as he separates from mom and learns that he is an independent person. It seems we spend the next several years trying to teach our children obedience and listening to mom and dad only to have that “no” rear it’s ugly head again, sometimes with vengeance, as our tweens and teens desire to break away. As parents, we need to wrap our brain around the fact that their “no” is a good thing. Yes, you heard me right. “No” can be a good thing. Pause. Take a deep breath. And let that sink in. We want to allow our kids to say “no” to us as they become older — as long as they can do so respectfully. This is their way of self-protection. It is how they figure out who they are and gain emotional awareness. It is through conflict resolved well that our teens learn skills that will help them navigate adulthood with maturity and deeper connection with those around them. They will learn that others are not necessarily all good (when I can get my way) or all bad (that person controls my every move). 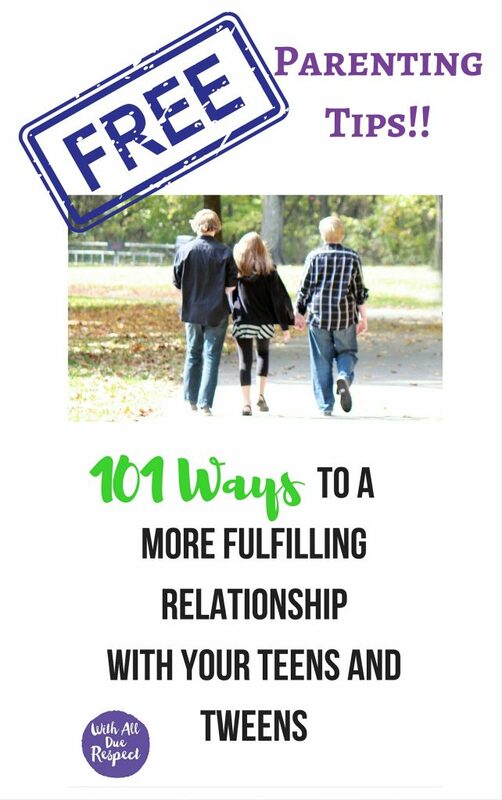 More than a decade ago my husband and I were struggling with one of our teens. Conflict was a daily interaction–sometimes with several occurrences during the same day. I felt totally inept and didn’t have the skills to navigate it. I was at a loss. I wanted to love this child but couldn’t seem to find the right balance of control versus letting her have her way. It felt that whatever decision I made one of us was going to lose and most likely it would be her with the outcome of her choice. Sometimes I would set a boundary, she would cross it, and I would get tired of implementing it over and over again. Talk about feeling overwhelmed. Then my husband Dave and I took a dramatic step. We decided to go to counseling together and were determined to find the counselor with the best reputation for handling conflict with teens in our city. We needed someone to help us parent this particular child. We were exhausted and at the end of our rope. That’s where we started learning the skills to help us navigate conflict as a family. Dave and I would give the counselor scenarios from the week’s drama in our home and he would patiently walk us through how we could have handled the situation differently. It was eye opening and refreshing to have a different perspective. These were skills I had never been taught. That’s where Dave and I learned that we needed to pause when we were in stressful situations of conflict. When our teen was having what seemed like a 2-year old meltdown, we learned to give her time to process the outcome of that “no”. Then we would re-engage with non-emotional conversation. As Dave and I were learning the skills with a professional, Nina Roesner and I would talk regularly about ways to apply these skills in both of our homes. We both began researching the brain science behind conflict focusing on communication skills that would foster deeper connection in a way that would help us deal with our challenging person more effectively. The more we would talk, the more skills we developed. We found that we had the perfect test lab for these skills in our own homes. We both had teenagers! What was amazing was what happened with my own family. Trust was built in ways I had never experienced before. My kids started coming to me with their questions more often. My husband and I grew closer as we worked hard to strengthen our marriage to parent our children together. We both came to realize the importance of being on the same page. I’ll admit that our one teen continued to be difficult, Even into her 20’s I continued to work on our relationship without much positive response. I prayed without ceasing and used the skills Nina and I had refined. But something was still missing. One day as Nina and I were talking it was as if a light bulb went on! I decided to try this new idea with my daughter. Those words meant so much to me! That’s what I want for you as a mom. I want you to feel those words even if you never hear them as your teens move into adulthood. And it doesn’t come with closing our eyes to their defiance and letting them do things their way without boundaries. It doesn’t come with control. It comes with the skills that help us deflate defensiveness and garner respect so that we can influence their decisions. 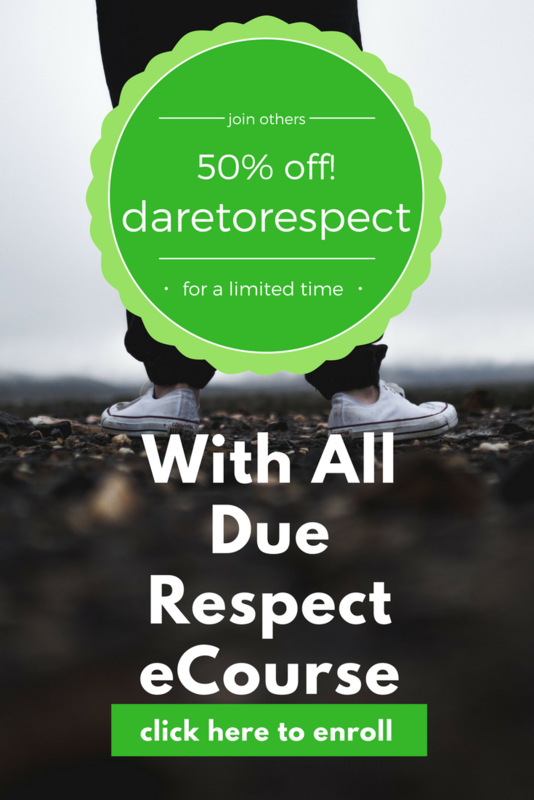 Dare 28 in With All Due Respect is about resolving conflict in your home. And it starts with us as moms in teaching them the skills they need. Scripture talks about resolving conflict as well. Dare you to become the peacemaker in your home and learn to offer reconciliation in a way that your teens can hear. 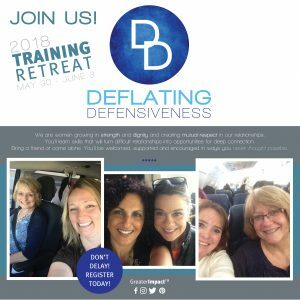 Join us for our all new Deflating Defensiveness Training Retreat near Cincinnati, Ohio May 30-June 4, 2018. It will give you the skills to navigate conflict in all your relationships as well as help you model them for your kids.